How We Can All Make A Difference! April 13th, this year, marks the International Day of Pink. This is a day where communities all over the world unite in celebrating diversity and raising awareness to stop all forms of bullying. “Mr. Rick Rossini, a former victim of bullying shared his story of how bullying affected his life, and the marvelous ways he learned to over- come it by practicing magic. Incorporating his magnificent acronym of B.A.N.D. TOGETHER. “The International Day of Pink was started in Nova Scotia when 2 straight high school students saw a gay student wearing a pink shirt being bullied. The 2 students intervened, but wanted to do more to prevent homophobic & transphobic bullying. They decided to purchase pink shirts, and a few days later got everyone at school to arrive wearing pink, standing in solidarity. The result was that an entire school stopped homophobic & transphobic bullying. Out of all the shows and presentations I do BAND TOGETHER – NO BULLIES ALLOWED is one of my very favorite. This is because I get the chance to “share” part of what happened to me in a way that just might really help someone else, and make a difference. And best of all when it really works – you feel the connection with ALL the kids! Thank you Centennial for allowing me to share my magic with your students. For more information on Day Of Pink please check out http://www.dayofpink.org/. 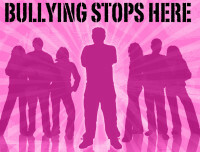 And for more information on my No Bullies Allowed Presentation click here. Posted in Helping Others, Magic, Uncategorized.